We are beyond excited to announce that Kelly Anna has joined Jelly. Known for her signature bold and vivacious style, Kelly Anna’s prolific output has earned her clients such as Nike, Stylist and Stella McCartney. 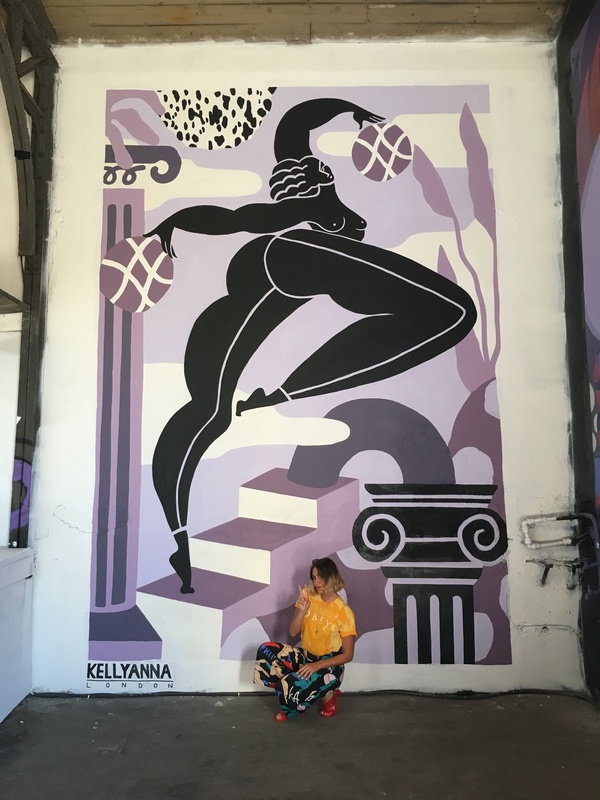 Kelly’s work is a plethora of vibrant colour palettes, fluid mark-making and abstract collage, with a penchant for strong black female figures that both question and celebrate modern femininity. 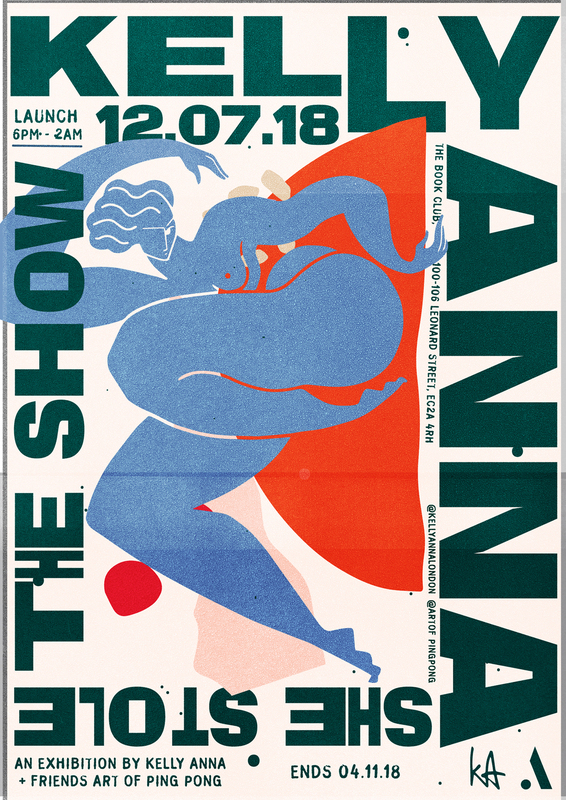 Her sensibility in colour and form sets her apart and enables her to address themes including fitness & self-care, shifting cultural norms and beauty standards, all with a complete sense of authenticity. 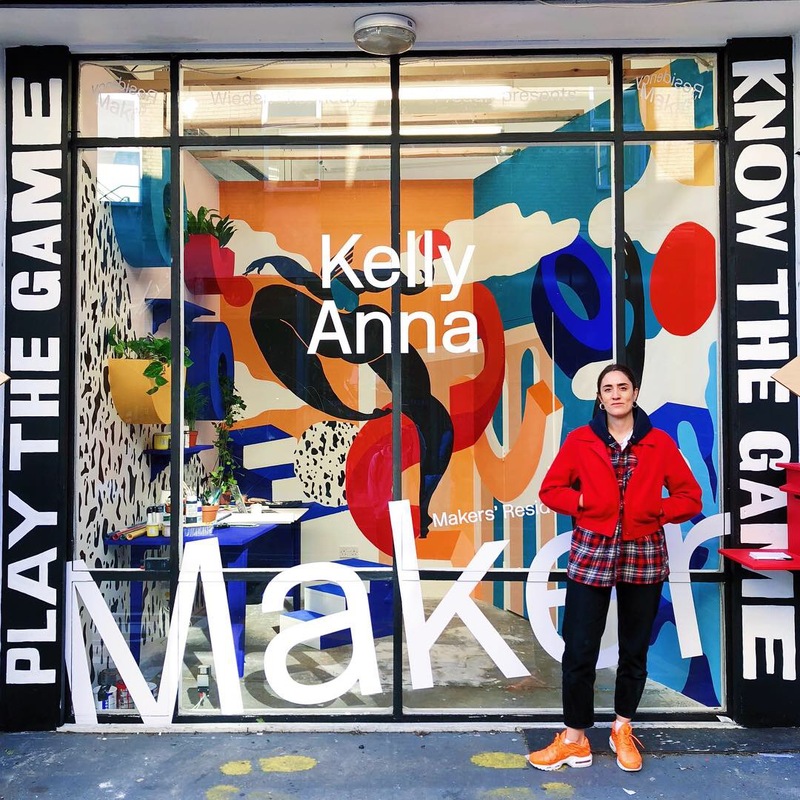 For her first project with Jelly, Kelly has created an interactive installation for Wieden+Kennedy’s Maker’s Residency, “Play The Game Know The Game” where passers-by are encouraged to leave notes of wisdom which Kelly then compiles and turns into a zine. The project tackles adolescent anxiety and depression with all proceeds going to a wonderful charity that supports those with mental health issues. So Kelly, tell us a bit about yourself, and how you became an illustrator? I’m an artist currently living in Peckham. My journey started out as a fashion illustrator sketching the looks on the catwalk for London Fashion week. I then spent years working as a freelance print designer working in sportswear, fashion and footwear. About 2 years ago. I decided I wanted to develop my own work and brand so that I could start working for myself. Since then I’ve been working on my own style and enjoying every moment! And how would you describe your own style at the moment? I would say energetic, bold and confident. Has female empowerment and strength always been so central to your work? Have you always been interested in depicting figures and movement? I never started drawing and thinking necessarily about female empowerment. I grew up with a very strong Italian mother. For me, confidence and strength were what I knew. So, I draw on my own depiction of women. I have only ever seen women and myself as empowering creatures. Depicting movement was always a part of my growing up. My dad is an artist himself and an incredible figurative artist. He taught me how to capture energy and movement. I used to practice these skills at Ballroom and Latin Dances where I would sketch the dancers moving around the floor. So, capturing movement and energy has always been integral to my work. 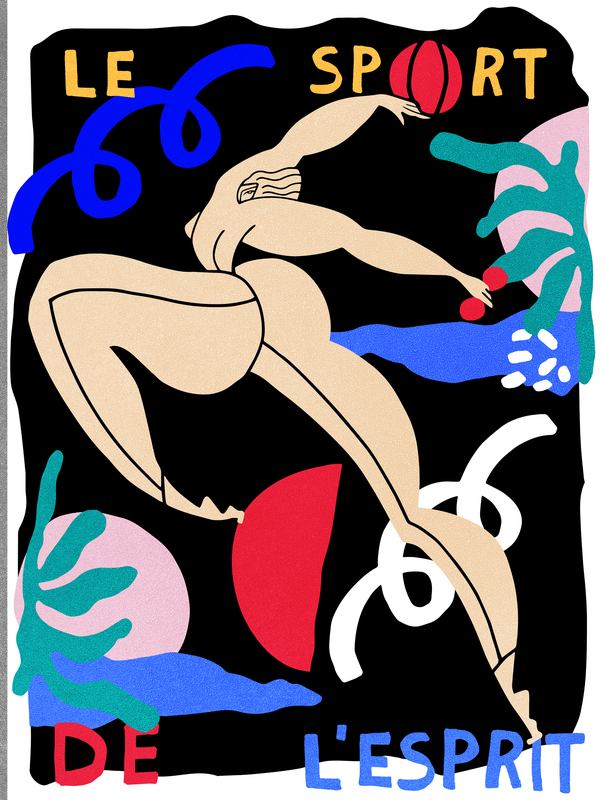 And to capture movement, where or who do you draw most inspiration from? I draw a lot of my inspiration from sports, music and what is happening around me in society. I love studying the world around me, especially the online world at the moment. I find old sports graphics are my favourite to look at, they have so much energy and I always love the compositions and textures. Above all though I’m obsessed with Mexican and Moroccan art! How would you say your style has changed since you started out? My style changes as I change. I can’t sit still, I have to keep moving always and I find my work follows with it. I think to be relevant today you have to change with the times, but it is integral to keep your own vision and voice. Changing medium and playing with different styles is the fun part! I would get so bored just sticking to one thing for the rest of my life and I don’t intend to. Speaking of changing mediums, you work across so many! What’s been your favourite project so far, and why? My favourite project was probably my mural in Biarritz. I absolutely loved seeing my work blown up that big. It was such an amazing project because I got to work with some of the world’s best graffiti artists and they took me under their wing and taught me some tricks! 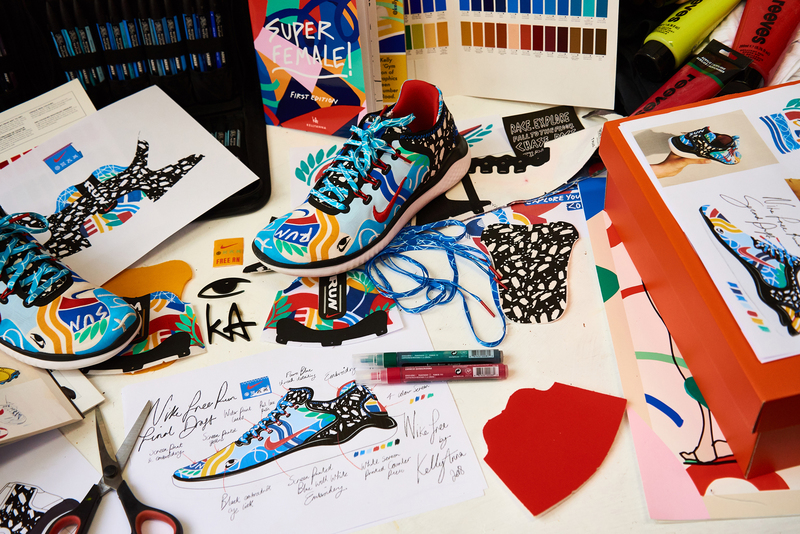 From painting a whole wall, to the more intricate design of Nike Free Rn, tell us what your brief was like for Nike. Were you given much freedom with design for this project? The brief was really fun. I was pretty free to do what I wanted. However, I don’t think they thought I would do what I did. Because I have worked in couture footwear, I know how to break a shoe up. So, when I received the sample, I cut the shoe up and painted straight onto the pattern pieces. My favourite thing to do is break up patterns and spaces and work on them individually. Each element or pattern should always be seen as a separate canvas. 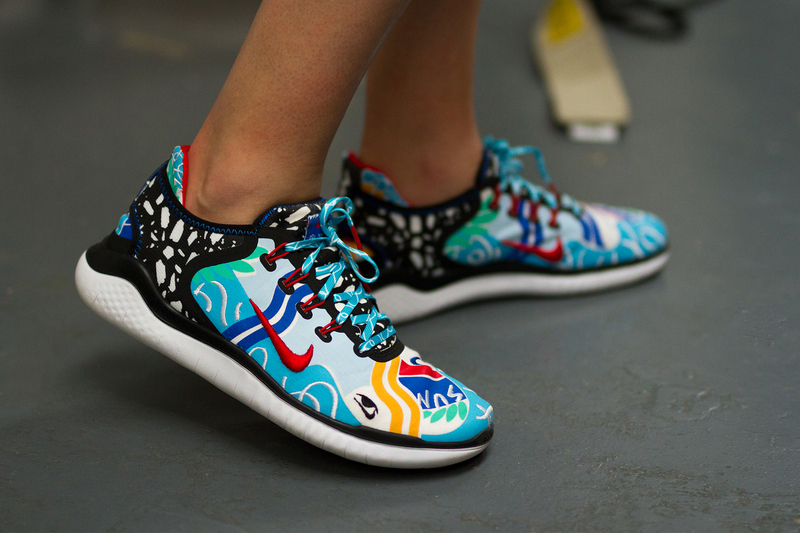 Talk us through your design for Nike Free Rn. The brief asked us what it means to be free in the cities we live through exploration and creative expression. 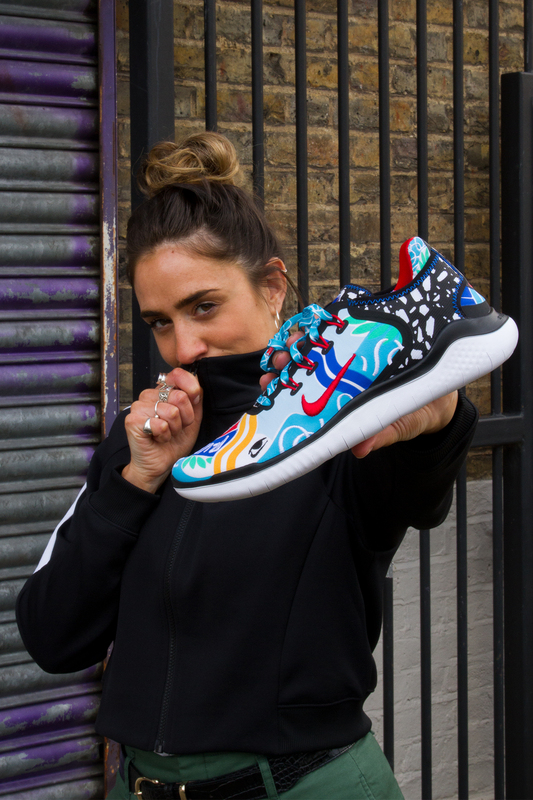 The shoe has a few little fun elements including the water print laces which represent the pulse of the city, the Thames. 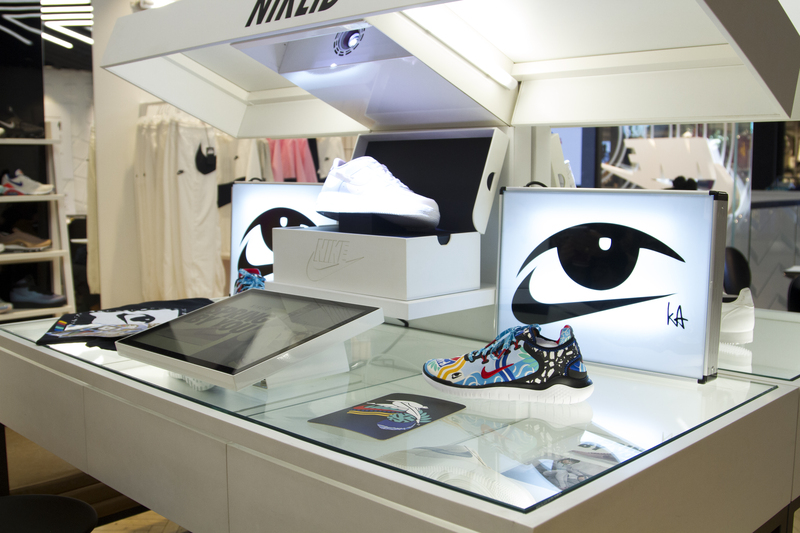 I also designed the Eye swoosh graphic, which represents London through my eyes. I created a black and white print pavement graphic on the counter piece which sits over the leafy collage screen prints. This represents the idea of weaving through the overbearing closeness of the towering urban spaces into the peaceful openness of the city parks when I run. What’s your creative process when it comes to illustrating and designing? Do you prefer to work in large or small scale? My creative process always starts out with sketching on an A1 or A0 sketch pad. I prefer to draw my shapes on bigger sketch pads as you get more movement and energy. I will then create collage pieces and do some mark making with colour and textures. I’ll then compile this all in digital. I love mixed media and playing with different materials, it’s the best part of what I do. I love then taking the artwork and working it into product! Whether that’s a shoe, a product or even a wall! Speaking of, had you planned your design for Peckham Levels, and if so, did much of your design change as you went along? I always plan my pieces before I start. When I do murals, I will often only get a few days to do it, so there is no room for experimentation on the day. I love knowing what will be created though, and then I get to enjoy painting it! That’s my favourite part! Peckham levels actually hadn’t seen it until it was done. They were very happy though! It felt amazing to have a client trust me and wait to see the final outcome. Do you work with music on? What’s the very last track you just played… be honest! I HAVE to listen to music when I work! I am a mad afro-beat, Hip hop, and Classical FM fan! My assistant laughs at me sometimes because I’ll blast Classic FM when she comes in. She secretly loves it! Couldn’t agree more about Classic FM! Have you got any exciting projects coming up? I have lots of fun things coming up. I am currently involved in the Makers Residency at Wieden+Kennedy which I am really excited about. 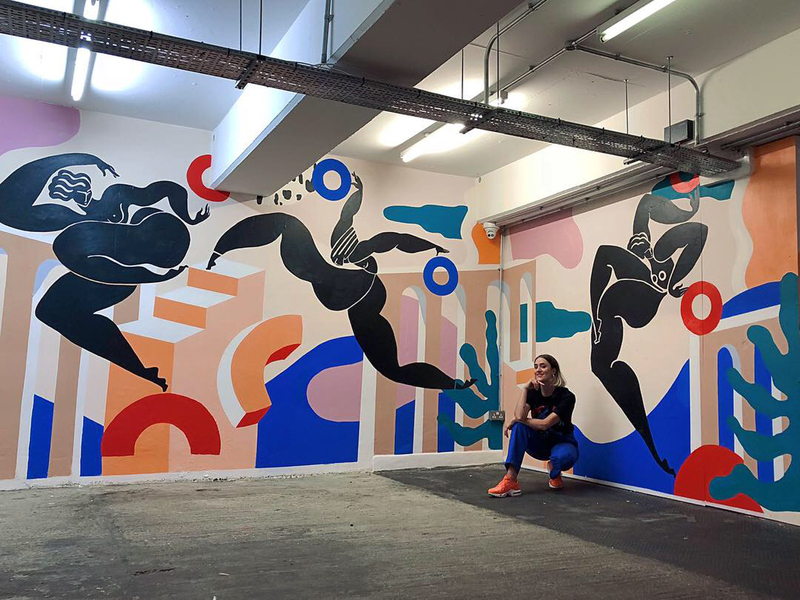 I am also doing a few more murals in Antwerp and Australia! And then some really exciting things happening at the beginning of next year! Sounds so exciting to be designing and painting murals all over the world! Finally, you’re on a deserted island – what 3 things can you not live without? My mum, my sketchbook, a cute fluffy looking cloud doggo because I couldn’t go a day without seeing a dog.